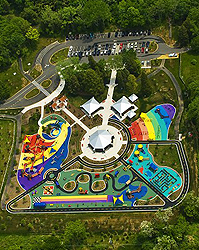 Clemyjontri Park, located at 6317 Georgetown Pike in McLean, is one of the first large-scale parks in the United States specifically planned and built so children with and without disabilities can play side-by-side. It has a two-acre playground with carousel where children who use wheelchairs, walkers or braces, or who have sensory or developmental disabilities can enjoy a complete and unrestricted playground experience. Clemyjontri Park attracts more than 80,000 visitors each year who come to enjoy the fully accessible playground, carousel, and swings designed to enable children of all abilities to play side-by-side. The wear and tear on the park and its unique play equipment and surfacing material require continuing and expensive maintenance and repairs. The 18-acre property and vision for Clemyjontri Park are thanks to benefactor Mrs. Adele Lebowitz. The generosity of the Lebowitz Family was recognized by the Commonwealth of Virginia General Assembly in House Joint Resolution 766. In 2018, a new picnic celebration pavilion was made possible thanks to generous contributions from McLean Community Foundation, Rotary Club of McLean, the Friends of Clemyjontri Park, Amy and Jeff Sonderman, and the friends and family of Sue Rowell, a longtime contributor to the park. The Friends of Clemyjontri Park also funded the new trackless train and a forthcoming train station. Partnership recognition was also extended to partner, McLean Project for the Arts, and Wheat’s for pro-bono landscaping services. Thanks to the generosity of Signature Sponsors Capital One Bank, HITT Contracting, Friends of Clemyjontri Park and other donors, the Park Foundation has enhanced Clemyjontri Park with a Liberty Swing. This specially designed feature is engineered to be fully accessible to children and adults in wheelchairs. Beyond the obvious play value, the Liberty Swing has significant therapeutic benefits including visual-spatial, muscle tone, head control and self-regulation. Now, all park goers may experience the exhilaration of swinging through the air, perhaps for the first time in their lives! 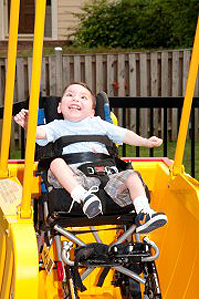 This wonderful park needs help from people who believe in Clemyjontri's dream — "a place where every child can play."